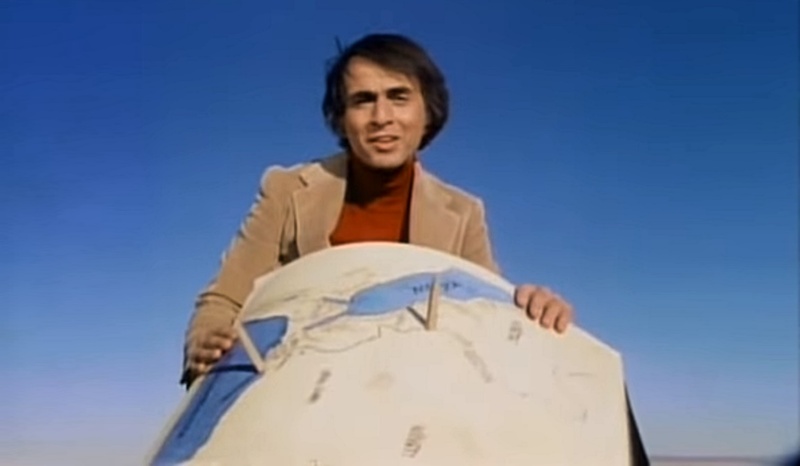 Carl Sagan’s TV series Cosmos has had an enduring effect on people’s perceptions of antiquity. Most of those perceptions are only half-true. There is some genuine factual material in Cosmos, but it’s pretty evenly blended with fiction. Sometimes that’s for the sake of making a good story. But often it comes from relying on sources who were lazy, who knew little about their subject, or who were heavily biased. For those who like to challenge popular misconceptions, it can be a little laborious to work out exactly which misconceptions come from Cosmos. So, here and in the next two posts, I’ll give a transcript of the segments that deal with ancient Greek science, with a few selected annotations. I’ve found that many people don’t appreciate just how much of an impact Cosmos has had in the 38 years since it was first broadcast. Let me illustrate. In 2009 the film Agora, directed and written by Alejandro Amenábar, perpetuated the myth that Hypatia’s death was linked to the catastrophic destruction of the famous libraries of Alexandria. There’s no reason to imagine any link between these two events (and little reason to believe that the second actually happened). Guess who invented the link? In 2016 a prominent website published a video on Eratosthenes’ measurement of the earth’s circumference. Guess who the video cited as its sole historical source? This video got 24 million views when it was posted on Facebook. Half of it was false. And every one of the falsehoods was repeated from Cosmos. Business Insider video on Eratosthenes’ measurement of the earth, July 2016: final shot (left) and the entire credits sequence (right). In 2017 an article in The Guardian pulled the same trick. Once again, it’s only half true. Once again, the author got all his history directly from Cosmos. Cosmos is getting a bit long in the tooth, but the entire series is on YouTube; it had a revival in 2014; another series is scheduled for 2019. Its influence lives on. 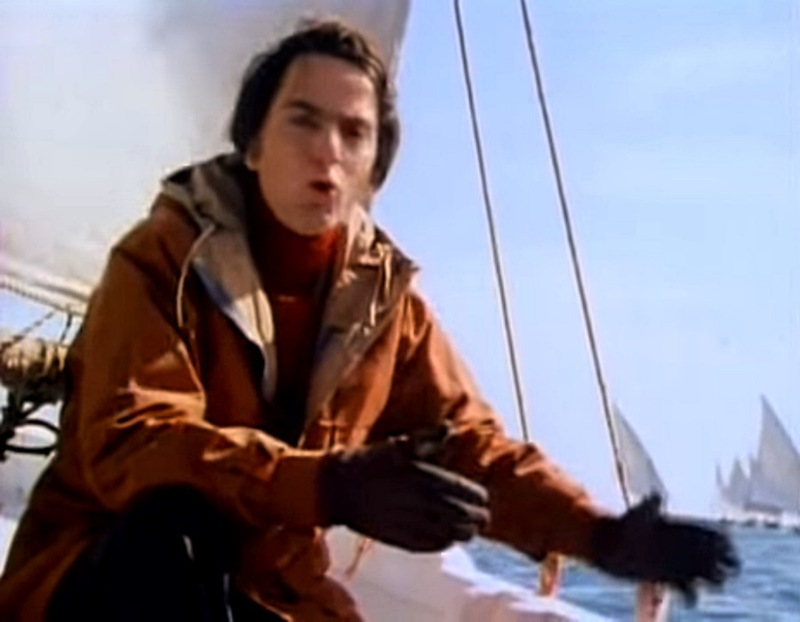 So, for those who want to know what stories Sagan spread, but who don’t want to have to spend thirteen hours watching the whole thing, here are the relevant bits, in three parts. Today: Eratosthenes. YouTube link. First broadcast 28 September 1980. There was once a time when our little planet seemed immense, when it was the only world we could explore. Its true size was first worked out in a simple and ingenious way by a man who lived here in Egypt, in the third century BC. This tower may have been a communications tower, part of a network running along the North African coast, by which signal bonfires were used to communicate messages of state. It also may have been used as a lighthouse, a navigational beacon for sailing ships out there in the Mediterranean Sea. It is about 50 kilometers west of what was once one of the great cities of the world, Alexandria. In Alexandria, at that time there lived a man named Eratosthenes. One of his envious contemporaries called him ‘Beta’, the second letter of the Greek alphabet because, he said, Eratosthenes was second best in the world in everything. But it seems clear that in many fields, Eratosthenes was Alpha. He was an astronomer, historian, geographer, philosopher, poet, theater critic, and mathematician. He was also the chief librarian of the great library of Alexandria. And one day, while reading a papyrus book in the library, he came upon a curious account. Far to the south, he read, at the frontier outpost of Syene, something notable could be seen on the longest day of the year. On June 21st the shadows of a temple column or a vertical stick would grow shorter as noon approached. And as the hours crept towards midday, the sun’s rays would slither down the sides of a deep well, which on other days would remain in shadow. And then, precisely at noon, columns would cast no shadows, and the sun would shine directly down into the water of the well. At that moment the sun was exactly overhead. It was an observation that someone else might easily have ignored. Sticks, shadows, reflections in wells, the position of the sun: simple, everyday matters -- of what possible importance might they be? But Eratosthenes was a scientist and his contemplation of these homely matters changed the world -- in a way, made the world. Because Eratosthenes had the presence of mind to experiment, to actually ask whether, back here, near Alexandria, a stick cast a shadow near noon on June the 21st. And it turns out, sticks do. 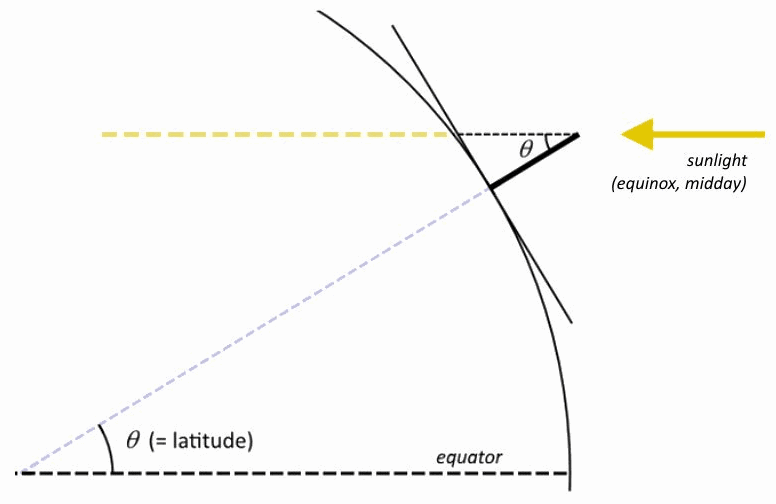 Notes: see this older post and this one on Eratosthenes’ measurement of the earth. Eratosthenes was not discovering secrets in obscure texts, but making use of long-standing public knowledge. The shape of the earth was well-known; measuring latitude with a gnomon was standard practice. The calculation was based on readings taken at Syene and Meroë, not Alexandria and Syene. Correction, two days later: thanks to Seb, in the comments, for pointing out my error here. According to Martianus Capella, Eratosthenes used readings taken at Syene and Meroë (not Alexandria); according to Cleomedes, at Alexandria and Syene (not Meroë). Cleomedes tends to have greater clout, but there’s absolutely no doubt that Eratosthenes did use readings from Meroë too. He regarded all three sites as being on the same meridian, and equidistant. He may have used one set of readings to corroborate the other. A well at Syene played no role in the calculation. The gnomon readings Eratosthenes used were taken decades before his time, and the overland distance estimates over a millennium earlier. The distance units definitely did not correspond to 800 km or 40,000 km. They were in the region of 900-960 km and 45,000-48,400 km. Still impressive, but more than ‘a few percent’ off. Eratosthenes improved on estimates reported by Aristotle (ca. 74,000 km) and Archimedes (ca. 55,000 km), but it was not a radical novelty. An overly skeptical person might have said that the report from Syene was an error. But it’s an absolutely straightforward observation. Why would anyone lie on such a trivial matter? Eratosthenes asked himself how it could be that, at the same moment, a stick in Syene would cast no shadow, and a stick in Alexandria, 800 kilometers to the north, would cast a very definite shadow. Here is a map of ancient Egypt. I’ve inserted two sticks, or obelisks: one up here in Alexandria, and one down here in Syene. Now, if at a certain moment each stick casts no shadow, no shadow at all, that’s perfectly easy to understand -- provided the earth is flat. If the shadow at Syene is a certain length and the shadow at Alexandria is the same length, that also makes sense on a flat earth. But how could it be, Eratosthenes asked, that at the same instant there was no shadow at Syene, and a very substantial shadow at Alexandria? The only answer was that the surface of the earth is curved. Not only that, but the greater the curvature, the bigger the difference in the lengths of the shadows. The sun is so far away that its rays are parallel when they reach the earth. Sticks at different angles to the sun’s rays will cast shadows at different lengths. For the observed difference in the shadow lengths, the distance between Alexandria and Syene had to be about 7 degrees along the surface of the earth. By that I mean, if you would imagine these sticks extending all the way down to the center of the earth, they would there intersect at an angle of about 7 degrees. Well, 7 degrees is something like a 50th of the full circumference of the earth, 360 degrees. Eratosthenes knew the distance between Alexandria and Syene. He knew it was 800 kilometers. Why? Because he hired a man to pace out the entire distance so that he could perform the calculation I’m talking about. Now, 800 kilometers times 50 is 40,000 kilometers. So that must be the circumference of the earth, that’s how far it is to go once around the earth. That’s the right answer. 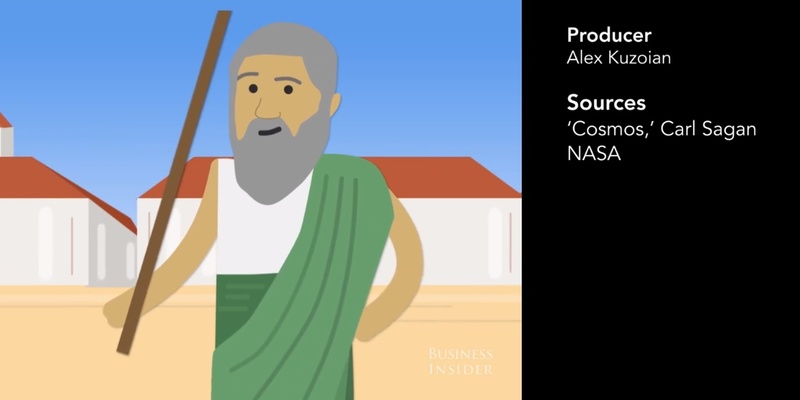 Eratosthenes’ only tools were sticks, eyes, feet, and brains -- plus a zest for experiment. With those tools he correctly deduced the circumference of the earth to high precision, with an error of only a few percent. That’s pretty good figuring for 2,200 years ago. Then, as now, the Mediterranean was teeming with ships: merchantmen, fishing vessels, naval flotillas. But there were also courageous voyages into the unknown. 400 years before Eratosthenes, Africa was circumnavigated by a Phoenician fleet in the employ of the Egyptian pharaoh Necho. They set sail, probably in boats as frail and open as these, out from the Red Sea, down the east coast of Africa up into the Atlantic and then back through the Mediterranean. That epic journey took three years, about as long as it takes Voyager to journey from earth to Saturn. After Eratosthenes, some may have attempted to circumnavigate the earth. But until the time of Magellan, no one succeeded. What tales of adventure and daring must earlier have been told as sailors and navigators, practical men of the world, gambled their lives on the mathematics of a scientist from ancient Alexandria. The story of the Phoenician circumnavigation of Africa in ca. 600 BCE is based on a single source, Herodotus 4.42, written ca. 425 BCE. It is not strictly impossible, but it is doubtful. Herodotus did not have direct access to written reports of the expedition, but relied on oral interlocutors. The most thorough geographic account of Africa that we have from the Mediterranean world, that of Ptolemy, has no known southern boundary to Africa. The one point that supports the story, that the sailors reportedly saw the sun in the northern half of the sky, is not necessarily proof: this would be observed in summer anywhere south of the Tropic of Cancer (still within the latitude of Egypt). Today, Alexandria shows few traces of its ancient glory, of the days when Eratosthenes walked its broad avenues. Over the centuries, waves of conquerors converted its palaces and temples into castles and churches, then into minarets and mosques. The city was chosen to be the capital of his empire by Alexander the Great on a winter’s afternoon in 331 BC. A century later, it had become the greatest city of the world. Each successive civilization has left its mark. But what now remains of the marvel city of Alexander’s dream? Alexandria is still a thriving marketplace, still a crossroads for the peoples of the Near East. But once, it was radiant with self-confidence, certain of its power. Can you recapture a vanished epoch from a few broken statues and scraps of ancient manuscripts? In Alexandria there was an immense library and an associated research institute, and in them worked the finest minds in the ancient world. Of that legendary library all that survives is this dank and forgotten cellar. It’s in the library annex, the Serapeum, which was once a temple but was later reconsecrated to knowledge. These few, moldering shelves probably once in a basement storage room are its only physical remains. But this place was once the brain and glory of the greatest city on the planet earth. If I could travel back into time, this is the place I would visit. The library of Alexandria at its height, 2,000 years ago. Here, in an important sense, began the intellectual adventure which has led us into space. All the knowledge in the ancient world was once within these marble walls. In the great hall, there may have been a mural of Alexander with the crook and flail and ceremonial headdress of the pharaohs of ancient Egypt. This library was a citadel of human consciousness, a beacon on our journey to the stars. It was the first true research institute in the history of the world. And what did they study? They studied everything, the entire cosmos. ‘Cosmos’ is a Greek word for the order of the universe. In a way it’s the opposite of chaos. It implies a deep interconnectedness of all things, the intricate and subtle way that the universe is put together. Genius flourished here. In addition to Eratosthenes, there was the astronomer Hipparchus, who mapped the constellations and established the brightness of the stars. And there was Euclid, who brilliantly systematized geometry, who told his king, who was struggling with some difficult problem in mathematics, that there was no royal road to geometry. There was Dionysius of Thrace, the man who defined the parts of speech -- nouns, verbs, and so on -- who did for language in a way what Euclid did for geometry. There was Herophilus, a physiologist who identified the brain rather than the heart as the seat of intelligence. There was Archimedes, the greatest mechanical genius until the time of Leonardo da Vinci. And there was the astronomer Ptolemy, who compiled much of what today is the pseudoscience of astrology. His earth-centered universe held sway for 1,500 years, showing that intellectual brilliance is no guarantee against being dead wrong. And among these great men, there was also a great woman. Her name was Hypatia. She was a mathematician and an astronomer, the last light of the library, whose martyrdom is bound up with the destruction of this place seven centuries after it was founded. Hipparchus did a lot more than Sagan says. He discovered many difficult points about the dynamics of the sun-earth-moon system, the periodicity of eclipses, the relationship between the solar and sidereal years, and much more. He should probably be regarded as the greatest astronomer of antiquity, perhaps alongside Eudoxus. Ptolemy was much more than a superstitious astrologer. His astronomical model was a more effective predictive tool than Copernicus’, and his works on cartography, music theory, and other matters are easily the most influential historical works ever written on those subjects. Archimedes lived in Sicily, not Alexandria. Hypatia was a major mathematician, but her astronomical work was confined to editing the text of Ptolemy’s Almagest. There is little to suggest a connection between her death and the destruction of the Mouseion: Sagan is directly responsible for the myth that a connection exists. Look at this place. The Greek kings of Egypt who succeeded Alexander regarded advances in science, literature, and medicine as among the treasures of the empire. For centuries they generously supported research and scholarship -- an enlightenment shared by few heads of state, then or now. Off this great hall were ten large research laboratories; there were fountains and colonnades; botanical gardens; and even a zoo with animals from India and sub-Saharan Africa. There were dissecting rooms and an astronomical observatory. But the treasure of the library consecrated to the god Serapis, built in the city of Alexander, was its collection of books. The organizers of the library combed all the cultures and languages of the world for books. They sent agents abroad to buy up libraries. Commercial ships docking in Alexandria harbor were searched by the police, not for contraband, but for books. The scrolls were borrowed, copied and returned to their owners. Until studied, these scrolls were collected in great stacks called ‘books from the ships’. Accurate numbers are difficult to come by, but it seems that the library contained at its peak nearly one million scrolls. The papyrus reed grows in Egypt. It’s the origin of our word for ‘paper’. Each of those million volumes which once existed in this library were handwritten on papyrus manuscript scrolls. What happened to all those books? Well, the classical civilization that created them disintegrated. The library itself was destroyed. Only a small fraction of the works survived. And as for the rest, we’re left only with pathetic scattered fragments. But how tantalizing those remaining bits and pieces are! For example, we know that there once existed here a book by the astronomer Aristarchus of Samos, who apparently argued that the earth was one of the planets, that like the other planets, it orbits the sun, and that the stars are enormously far away. All absolutely correct! But we had to wait nearly 2,000 years for these facts to be rediscovered. The astronomy stacks of the Alexandria library. Hipparchus, Ptolemaeus ... here we are: Aristarchus. This is the book. How I’d love to be able to read this book, to know how Aristarchus figured it out. But it’s gone, utterly and forever. If we multiply our sense of loss for this work of Aristarchus by 100,000, we begin to appreciate the grandeur of the achievement of classical civilization and the tragedy of its destruction. Aristarchus was a gifted mathematician, but his heliocentric model was apparently speculative, not based on any observational evidence. That’s certainly how it is with the only other heliocentrist that we know of, Seleucus, who relied solely on a priore assumptions for some of his arguments (see Neugebauer, History of ancient astronomy pp. 697-8). Archimedes reports that Aristarchus actually made the stars infinitely distant. Heliocentrism was not taboo: Archimedes for one took it seriously. But only Seleucus is known to have been persuaded by it. Copernicus wasn’t delighted to ‘rediscover’ Aristarchus, he was annoyed that someone else got to the heliocentric model first. He erased Aristarchus from the published version of his book, deleting references Correction: one reference that he had written in his manuscript. Correction, a few days later: Viktor Blåsjö has pointed out on Twitter that Copernicus was only barely aware of Aristarchus’ heliocentrism. Our main source (Archimedes’ Sand-reckoner) was published the year after Copernicus’ death. He certainly didn’t plagiarise Aristarchus or anything like that: he simply removed a passage discussing ancient proponents of the idea that the earth moves. We have far surpassed the science known to the ancient world, but there are irreparable gaps in our historical knowledge. Imagine what mysteries of the past could be solved with a borrower’s card to this library. For example, we know of a three-volume history of the world now lost, written by a Babylonian priest named Berossus. Volume 1 dealt with the interval from the creation of the world to the great flood, a period that he took to be 432,000 years, or about 100 times longer than the Old Testament chronology. What wonders were in the books of Berossus? But why have I brought you across 2,000 years to the library of Alexandria? Because this was when and where we humans first collected, seriously and systematically, the knowledge of the world. This is the earth as Eratosthenes knew it: a tiny, spherical world, afloat in an immensity of space and time. We were at long last beginning to find our true bearings in the cosmos. The scientists of antiquity took the first and most important steps in that direction before their civilization fell apart. But after the Dark Ages, it was by and large the rediscovery of the works of these scholars, done here, that made the Renaissance possible and thereby powerfully influenced our own culture. When in the 15th century Europe was at last ready to awaken from its long sleep, it picked up some of the tools, the books, and the concepts laid down here more than a thousand years before. By 1600, the long-forgotten ideas of Aristarchus had been rediscovered. Johannes Kepler constructed elaborate models to understand the motion and arrangement of the planets the clockwork of the heavens. And at night, he dreamt of traveling to the moon. I wanted to ask about your comments on Eratosthenes and specifically your points #2 and #4: "The calculation was based on readings taken at Syene and Meroë, not Alexandria and Syene ... Observations were taken at the equinoxes, not the solstice." What, then, do you make of the accounts of Cleomedes and Pliny, which do use the examples of Alexandria and the solstice? In your earlier post, you used less conclusive language, suggesting it was "not just" Alexandria (and the solstice) "but also" Meroe (and the equinox). I'm convinced by that, for all the reasons you gave. So I'm curious why you've strengthened your opinion in this post? Since we don't have Eratosthenes' own account, how sure can we be? I have always taken this story to be a demonstration, not really intended as an accurate measurement (but maybe I'm too reliant on Cleomedes' account, as against Strabo's) and for demonstrative purposes Alexandria works well enough (also, we know Eratosthenes was in Alexandria). As for the equinox, I grant that it works much better as a basis for geographical and astronomical understanding, but the solstice is good for a demonstration. And FWIW I think you were right first time about the time of year not mattering: for this purpose I think we can take the sun's rays to strike all places on earth at the same angle at any time of year. I'd be interested in your thoughts on this. Thanks again. Thanks for the comments Seb. You're right, I neglected Cleomedes: thanks for pointing it out, and I'll add a correction. Anyway, Cleomedes does offer a rather striking disagreement with Martianus Capella and Vitruvius, doesn't he? With Martianus Capella over the locations used, and with Vitruvius over the season. In light of that, I'd speculate that the inconsistencies may result from Eratosthenes using both pairs of cities, and readings at both seasons: each source could have quoted him selectively as a result. So, with the two pairs of cities, the fact that the distances Alexandria-Syene and Syene-Meroë were regarded as equal seems key: E. may have used one measurement to corroborate the other. Similarly on solstice vs. equinox: consider how, according to Strabo, Philon took gnomon readings at Meroë at both the solstices AND equinoxes. It's a while since I've looked at this material. I'll blame the less equivocal tone I've taken here on that ... though the resulting inaccuracy (slipping up over Cleomedes) is undoubtedly my fault. Thanks - that's very helpful. It's interesting to see how later writers draw on Eratosthenes in different ways/for different purposes. I'm looking forward to the next installment!